Described as “happiness on wheels” vintage trailers have steadily been increasing in popularity in recent years. The interest in these relics of road history has sparked in part because of new television shows such as “Flipping RVs” which dedicate 30 minutes to restoring them to their former or new glory. An internet search will find groups and businesses dedicated to vehicles that bring back memories of days before cell phones and television when families would often squeeze into tiny spaces to play cards, eat and sleep. The Tin Can Tourists is one of the many groups that celebrates the history of these recreational vehicles and use specific guidelines for judging in shows. The guidelines state that a trailer must be 25 years old to be considered vintage. A motor home is considered vintage if it is 20 years old. 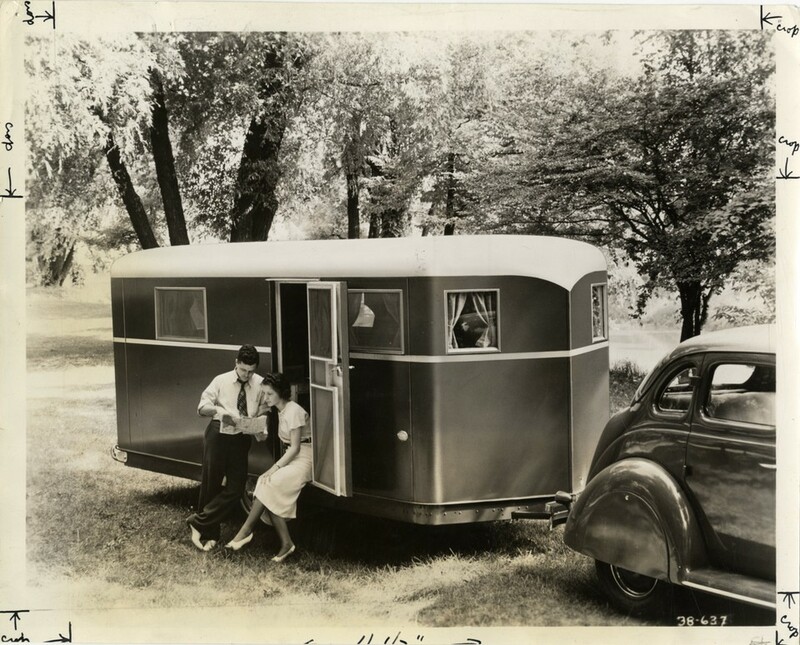 Beginning as a camping group in 1919, Tin Can Tourists disbanded in the mid-1970s and was renewed in 1998 as a model vintage trailer and motor coach club. More than 29,000 people subscribe to their Facebook group and rallies and events are held across the country throughout the year. Their membership page highlights people of all ages, including families with young children. Terry Bone, the Mid-States representative for the group explains that people are attracted to vintage RVs for a variety of reasons. “[It is all about] memories of childhood or influences from parents or family oriented activities [from the past],” Bone continues. “Campgrounds [in this way] cater to the whole family and are cost effective. It brings you back to a more relaxing and social time”. In Bone’s estimation, many people are looking to escape the trapping of modern society—cell phones, computers and the Internet but that, more times than not, friendships are made over the common interests. Kelle Arvay of Little Vintage Trailer first became interested in vintage trailers in 2009 but now says the interest today goes beyond camping. “I think the interest has spread to those that not only want to camp in them and participate in rallies and gatherings, but also there are a lot more interest in using them as mobile businesses, full-time living and even as short term rentals,” she said. As expected, the RVs of yesteryear are different than their modern counterparts. Three words immediately come to mind, according to Arvay—design, materials and charm. The reality TV show craze has also not left this niche unturned. The host of the show Flipping RVs are active members of the vintage community. Vintage RV sales, as a result, have soared. One original aspect of vintage RVs is that one could get a working project trailer for about $500. That has changed. Tin Can Tourists is one of many sites that feature classified listings. Arvay also lists vintage trailers for sale on her site. One recent sale was a 1968 Go Tag Along camper named “Birdie” that had an asking price of $5,400. Weighing less than 2,000 pounds, Birdie had comforts such as air conditioning, a microwave and a television. But she didn’t have a restroom, which is not always a deal breaker for buyers, Bone said. Bone recommends anyone with an interest in vintage trailers to attend a rally. Rallies are held all over the country. The biggest are in the Midwest and happen in the spring and fall at Camp Dearborn in Milford, Michigan. Other well-attended rallies include the Pismo Beach Rally held in Orange, California in May and the Winter Convention held in Brooksville Florida which is usually held in February. Vintage Trailers will continue to be a boon for collector and nostalgic campers alike. What places like Tin Can Tourists offers though is a sense of community that binds like minds together.